All court tennis: satisfying, easier, more successful. I love the fact that tennis is a sport we can play our entire lives. I believe that the secret to maximizing this experience in every way is to become an all court player. All-court tennis is more physically satisfying and mentally engaging than having a one-dimensional game. It is much easier on your body as well. I love the pro game as well, but how realistic is it for the average player to try to build a game after someone like Rafael Nadal? Realistically, becoming an all-court player is the way to go for the vast majority of club players. What do I mean by all-court tennis? To explain I need to talk about the man who completely rebuilt my own game. His name was Tom Stow. He also became the inspiration for my whole philosophy as a teacher. Tom was a fine player, good enough to have won the NCAA doubles title while at the University of California at Berkeley in 1925. But where Tom left his mark on the game was as a teacher. Tom Stow changed my life. There have been very few people in the history of the game who studied strokes the way Tom did. His pre-eminence as a student of the game earned him the nickname “The Maestro” and drew praise from the legends of his own day like Jack Kramer and Pancho Segura. For many years Tom was the head pro at the legendary Berkeley Tennis Club where I am a member and still play today. During his time there Tom worked with several Tennis Hall of Famers including Sarah Palfrey, Margaret Osborne and, most notably, the great Don Budge. Budge, the first man to win all four Grand Slam titles in a calendar year, often credited Tom with refining his entire approach to building points. As far back as the 1930’s, Tom saw remarkable, revolutionary connections between tennis and everything from golf to ballroom dancing to boxing. His knowledge about such concepts as weight transfer and swing shape helped him create an incredibly efficient way of striking the ball that made it easy to play forceful all-court tennis. And he proved its effectiveness not only at the world class level, but with hundreds of players he developed at all levels. Don Budge, the best known of the Hall of Fame players Stow trained. To give one example, Tom also taught Tony Price. Now I’m quite certain you’ve never heard of Tony – and that is precisely my point. Tony’s now in his early 60s. He plays a fine grade of 4.5 level tennis. But here’s what I love about Tony’s game: Tony’s comfortable in all parts of the court. If he needs to, he can strike crisp forehands and backhands. When he draws a short ball, his footwork moving forward is superb and he gets himself in the right place to hit the ball with power. Once he’s at the net, Tony volleys quite nicely. Tony knows the fundamentals of his own game so well, he can go six months without hitting a ball and then, with barely three minutes of warm-up, feel grooved and ready to go. To me, Tony’s game living proof of the principle of all-court tennis: When you use more of the court, you play better tennis. You also have a lot more fun. And that is the premise of the all-court approach Tom Stow taught. The premise is with proper grips, swing shapes and body movement, it’s quite possible to build a game that lets you play with the skill, the passion and the pleasure of a Tony Price. When you learn to hit the ball the way Tom taught, there is another huge benefit. Tony Price rarely gets injured. I believe playing all court tennis you save wear and tear on your body. Can you chase balls all day ten feet behind the baseline? This notion about health – and fun -- is very important to me. The professional game has evolved to the point where most of what you see on TV today is heavy-duty baseline tennis – based on extreme grips and body rotations, two-handed backhands and, heavy spin. But I think we can all agree that 99.9 percent of the people who ever pick up a racket will never play on the ATP or WTA tour. So why are people learning to play like that? I wince sometimes when I see how the game is currently being taught and what a narrow range of skills so many youngsters are acquiring. I wince even more when I see older players – many of whom only play doubles – are now trying to learn forehands hit with Western grips. All court tennis means the ability to play the net. After all, can you really torque your body like Andy Roddick and expect to play all-court tennis your entire life? It’s one thing to have a young supple body like Rafael Nadal and be able to chase balls all day five or ten feet behind the baseline, but if you’re not a world-class player, is it really fun to play that way? A former junior player I know is now 23 years old and learned to play the contemporary style, including an extreme semi-western grip on the forehand and a one-dimensional baseline game. She got good enough to play college tennis for four years. She won tons of matches on fitness and patience. But recently she confessed to me that she’s bored by tennis and the way she plays. At this point, it seems, her brain is now bigger than her game. Her technique and tactical style is prohibiting her from using her imagination. In many ways she’ll have to start over if she wants to play the game with the skill of Tony Price. Taking the ball early, using slice, playing serve and volley. I believe that young players who become locked into the topspin baseline swing patterns with no real variety are going to be abandoning tennis as they grow older. When you try to play like today’s pros, the game becomes too hard, limited and boring. Consider, for example, how hard it is for someone copying the contemporary pro style to effectively play doubles. The grips and strokes are ill-fitted for everything from service returns to volleys and transition shots. And equally tragic, the court sense that’s learned by using those techniques is extremely limiting. Now don’t get me wrong. I love the enthusiasm and tenacity of Roddick and Nadal. And I think to some degree there are discreet things each of us can learn from top pros. I’ve studied tons of high speed footage on Tennisplayer in order to understand the fundamentals that transcend all technical styles. But my experience teaching all-court tennis for 25 years has shown me there’s a way out there that’s easier and more fun. And by more fun I don’t mean goofing around. I equate “more fun” with improvement. That means competing more effectively against a broader range of players in everything from practice matches to league and tournament play. Forcing shots create court position and opportunities to win points. The all-court approach can also help you become a much more forceful singles player. Tom Stow's philosophy was to apply pressure through what he called a forcing game. Tom's premise was that if you developed sound stroke fundamentals that you could hit enough "forcing" shots and use those shots to establish sound court position. Soon enough the other guy would either miss or give you an easy ball you could place for a winner or hit an approach and go in with a positional advantage. Don Budge did this so well that opponents said they felt helpless playing him. All court tennis is the best style for doubles. Let's take a look at how an all-court approach is also a perfect fit for doubles. As we all know, the name of the game in doubles is to establish good court position at the net. The all court approach to developing your game helps you accomplish this. The emphasis is on volley-friendly grips, compact strokes, efficient movement and recognition of which places on the court are most important to occupy. There are a number of productive techniques, drills and patterns you can apply that will help you and anyone you play with collaborate more effectively. I learned the effectivenhis approach through personal experience. I was fortunate to begin working with Tom Stow when I was 30 years old. I was teaching tennis then, but in retrospect I realize that in many ways I was deceiving myself both as a teacher and a player. As a teacher, I was mostly drawing on clichés, all those familiar lines like “get the racket back,” “swing through it,” “bend your knees,” and, of course, “watch the ball.” I didn’t really have any kind of system for helping players learn to play better. As a player, I was probably what would today be labeled a 4.5 on the NTRP scale. But my strokes were a joke – a wristy forehand my buddies and I called “the flick,” along with a backhand known as “the cut” and volleys I kind of poked. I knew if I wanted to talk the talk with my students, I’d have to learn to walk the walk first. So with Tom, I pretty much gutted my entire game. For about 18 months, I relearned every stroke from zero. It took a lot of work. The gold ball I received for winning the national 35 and over hardcourt doubles title. One of the most important principles I learned was: don’t fight the ball. Learn how to efficiently use your body to generate pace and accuracy. Eventually that hard work paid off. Five years after I first called Tom Stow I was fortunate enough to win the National 35 hardcourt doubles title. I can guarantee you that without him, I’d never have won a set at a tournament like that. Over the years I have continued to do well both in sectional and national singles and doubles. Now to learn all-court tennis do you have to gut your entire game the way I did? Not necessarily. Not everyone has the time, the inclination or the need to improve their game this way. My approach calls for constantly pursuing ways to improve. At a minimum what I want to suggest is approaching the game a little differently. The way I see it, there are two kinds of people who play tennis: hackers and players. A hacker is content with what he already has. And to me there are some hackers in the top 200 in the world. Being a hacker might mean beating the same guy every Sunday, or doing well in league play, or even having a high ranking at a sectional level. But the hacker is so addicted to outcome – those precious results – that he is resistant to making long-term changes that might cost him in the short-term. Don't fight the ball: use your body to generate pace and accuracy. “Players,” on the other hand, are open to new ideas that might cost them some immediate gratification, but over the long term will yield greater rewards. And yes, I’ve seen 3.0 players who embody this principle. I can guarantee you it took Tony Price a while longer to learn a topspin backhand than if he’d merely stuck with the one-handed slice. But if you really put in the effort to develop all-court tennis, I can guarantee that you’ll play better and have better results. Once I worked with Tom Stow I saw that my days of “grab-bag” teaching and tips were over. His approach to all-court tennis gave me a big picture approach and a unified system that gets results. They hit the ball better and they have more fun doing it. What more could you ask for? Stay tuned for more on my approach. Brent Abel is the founder of WebTennis.net, dedicated to all court tennis. For over 20 years he has been an elite senior player at the national level. His numerous titles include a prestigious gold ball as National Hardcourt Doubles Champion. 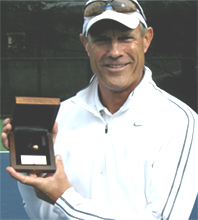 Brent began his teaching career at the fabled John Gardner’s Tennis Ranch in Carmel Valley, California. 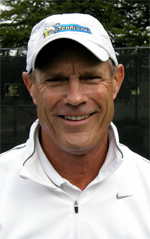 In addition Brent has taught at some of the most respected clubs in the Bay Area, including the Moraga Country Club, the Tiburon Peninsula Club, and the California Tennis Club. He still plays regularly at the Berkeley Tennis Club where he first met the great Tom Stow. Brent Abel’s WebTennis.net, provides free instructional tips and also offers commercial instructional products that deliver on his commitment to teaching all-court tennis. There are simple drills you can do by yourself, as well as practice routines you can try with a friend. Other drills focus on aspects of stroke production, match play tactics, and especially the cornerstone of all-court tennis – court positioning. Plus plenty of doubles tips. There is also a free newsletter. Everything works together as part of Brent’s unified teaching system for becoming an all-court player.